I always find touring cities intriguing because with all the modern changes there is history all around you, if you take the time to stop, look, then explore. I saw a Smithsonian Museum right in the heart of Manhattan on my previous tour of the city in 2015, so naturally I had to visit. The Museum of American Indian. The Philly & Amish Country day trip tour started in the city's historical district, the walkabout took us pass some of the notable buildings, The First Bank of United States, The Mint, Carpenter's Hall, Betsy Ross House and Franklin Court Market Street houses. I was fortunate to meet Chris the Resident Woodcarver at the Amish Farm and House, and had a pair of wooden spoons personalized. The tour kicked of on the weekend prior to start of the Feast of San Gennaro in Little Italy, so all the street decor was up, the restaurants were doing good business, as people from all walks of life came out the enjoy the pre-event energy it was festive. 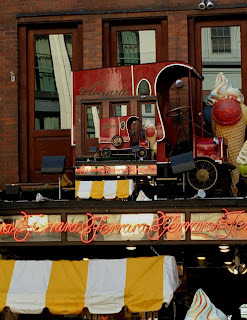 I had ice cream at Ferrara's yummy. I saw there was an Italian American Museum along the way, I anticipate a visit in the future. Then off to Chinatown we go for some Dim Sum and view a few games at Columbus Park.